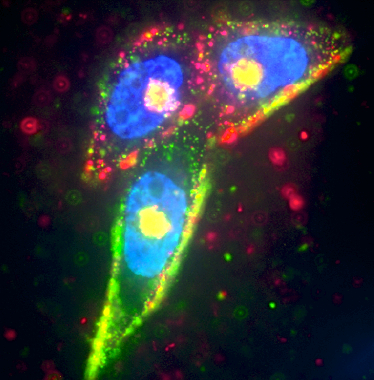 Prostate cancer cells were targeted by two separate silver nanoparticles (red and green), while the cell nucleus was labeled in blueusing Hoescht dye. One nanoparticle carries CendR peptide (RPARPAR) on the surface (red), the other LyP-1 peptide (green). The cells take up nanoparticles coated with two different peptides and transport them to the center of the cell. 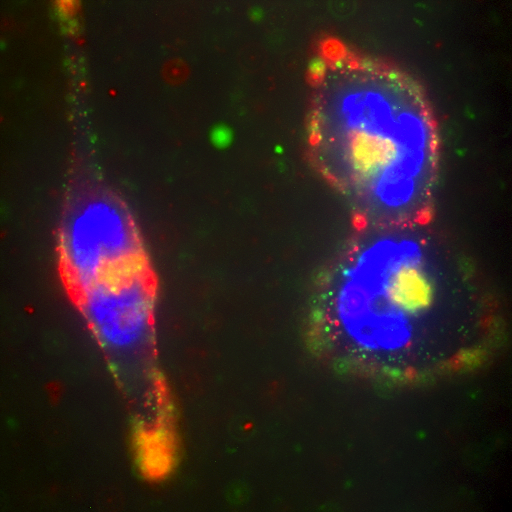 Left: Extracellular (green) and intracellular nanoparticles (yellow) tightly surrounded by cell membrane (red). 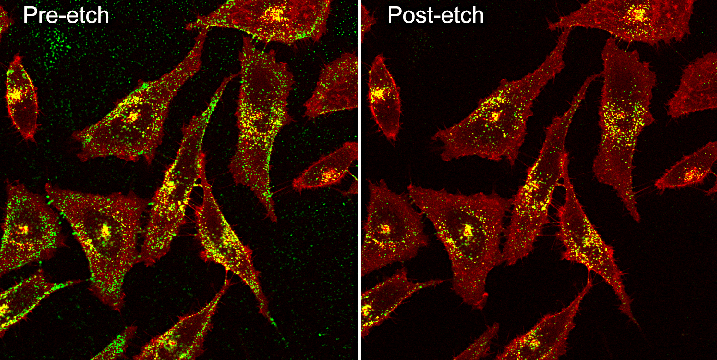 Right: Nanoparticles in cells survive the etching solution. Scientists at UC Santa Barbara have designed a nanoparticle that has a couple of unique — and important — properties. Spherical in shape and silver in composition, it is encased in a shell coated with a peptide that enables it to target tumor cells. What’s more, the shell is etchable so those nanoparticles that don’t hit their target can be broken down and eliminated. The research findings appear today in the journal Nature Materials. UCSB’s Ruoslahti Research Laboratory also developed a simple etching technique using biocompatible chemicals to rapidly disassemble and remove the silver nanoparticles outside living cells. This method leaves only the intact nanoparticles for imaging or quantification, thus revealing which cells have been targeted and how much each cell internalized. Some drugs are able to pass through the cell membrane on their own, but many drugs, especially RNA and DNA genetic drugs, are charged molecules that are blocked by the membrane. These drugs must be taken in through endocytosis, the process by which cells absorb molecules by engulfing them. Because the nanoparticle has a core shell structure, the researchers can vary its exterior coating and compare the efficiency of tumor targeting and internalization. Switching out the surface agent enables the targeting of different diseases — or organisms in the case of bacteria — through the use of different target receptors. According to Braun, this should turn into a way to optimize drug delivery where the core is a drug-containing vehicle. 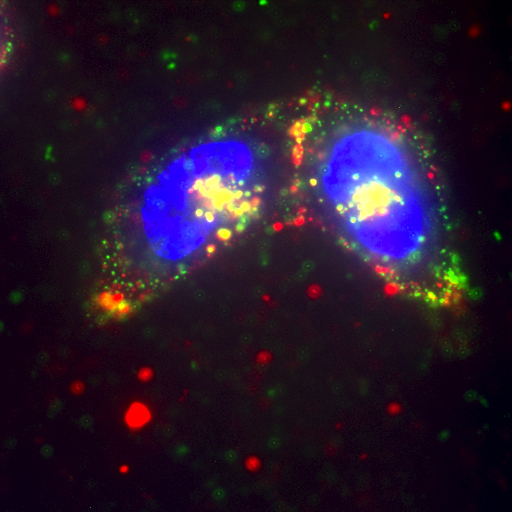 Peptide-coated silver nanoparticles moving toward and being "eaten" by a prostate cancer cell (green).